After their son Blaine died in a pump truck rollover, Wendy-Ellen and Bruce Nittel had a visit from Blaine’s employer, who wanted to help them in some way. 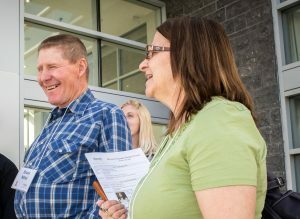 As well as driving Blaine’s pick-up home, the company’s staff gave the Nittels an envelope of information from Alberta Occupational Health and Safety, including a brochure from Threads of Life. Soon after, Bruce and Wendy-Ellen reached out for more information and decided to attend a family forum. It was very early in their grief journey; however, they both say it was the right place for them to be and the family forums became a significant part of their healing. For Wendy-Ellen, her mothering instincts kicked in and she knew that she wanted to be part of prevention. Through the speaker’s bureau she shares Blaine’s story with the hope that through awareness, there would not be so many new members to this club. Bruce’s role in the beginning was to be a support person to ensure that Wendy-Ellen got safely to and from her presentations. In time he found himself standing next to her, sharing the Threads of Life messages to managers at the TriWest partner event and then at health and safety conferences. He found his role is to help people understand the culture change. He relates to people that the safety change is their responsibility – in everyday life, not just at work. Safety attitudes need to be a part of our daily lives. As a rancher, he often found himself doing things independently, that he now knows he needs to wait and find a second pair of hands. He shares everyday scenarios with people, such as when driving a highway with a posted speed limit of 110k/hr, be sure the road conditions actually make that safe. In the earlier years of ranching, Bruce handled pesticides and herbicides as all ranchers and farmers did. They didn’t have the information they now have on how to handle these products safely and as such is living with Chronic Lymphocytic Leukemia. In 2014, while doing his farm chores, he slipped on ice and dislocated his shoulder. At trade shows and conferences, Bruce and Wendy-Ellen are able to use these examples as they help others to understand the need for the culture change. Wendy-Ellen shares her life experience as a teacher and a strong volunteer with 4 H clubs in Alberta as a member of the Board of Directors for Threads of Life. Her role is to ensure that voice for family is always part of the decisions that are made. Bruce, ensures she always has transportation to and from her flights. At their very first family forum, Wendy-Ellen’s caring attitude for others was evident. Soon after she took the Volunteer Family Guide training. She not only listens as others share their very personal story, but realizes that though that caring, she is helping others. Bruce and Wendy-Ellen share that Threads of Life is part of their life-line, their safety net. At the same time, when they attend the family forum they ensure that participants hear ‘it is good to shed tears’. They enjoy the people they meet and when someone reaches that ‘ah-ha’ moment – they know they made a difference. Together they share of themselves to care for others, help others to be aware of hazards in the workplace and their love for Blaine gives them the courage to do so.